Images of the Stinson 108, and other Stinson light aircraft, instrument panels. My thanks to David Talley and Jack Harris for providing the Stinsonflyer server to store these images on! Instrument Panel of the Voyager 125 NX31519. 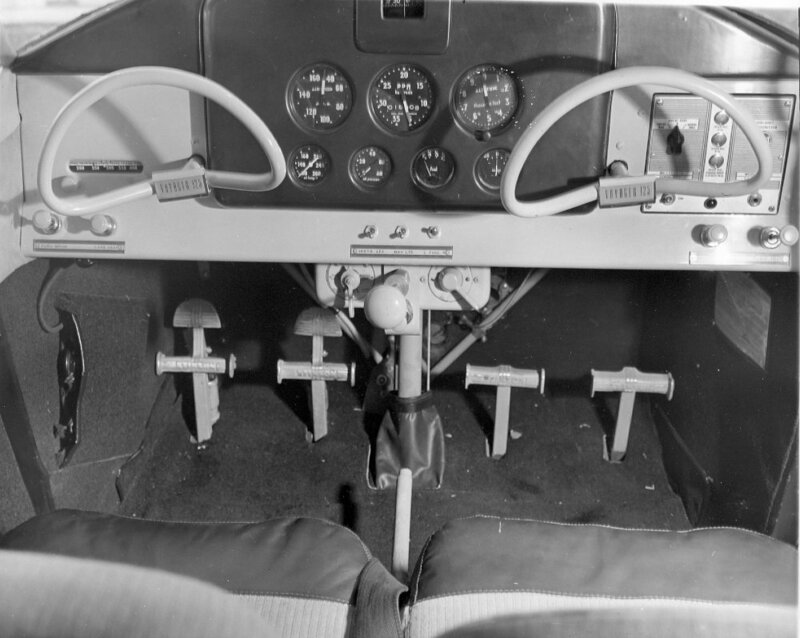 This instrument panel view shows its ancestry as this airplane was a modified model 10 and this instrument panel is very close to the model 10. 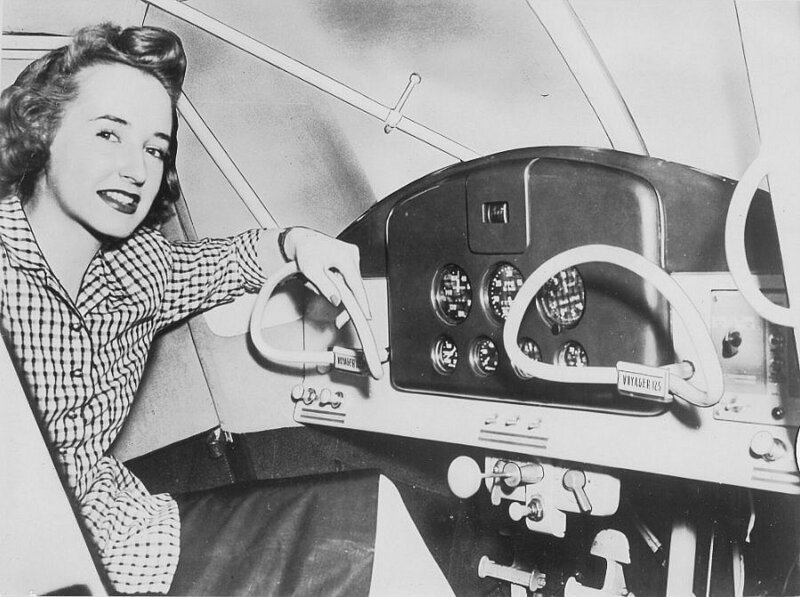 Some interesting points, the girl is labeled on the press release as "an American girl sits in the cockpit." 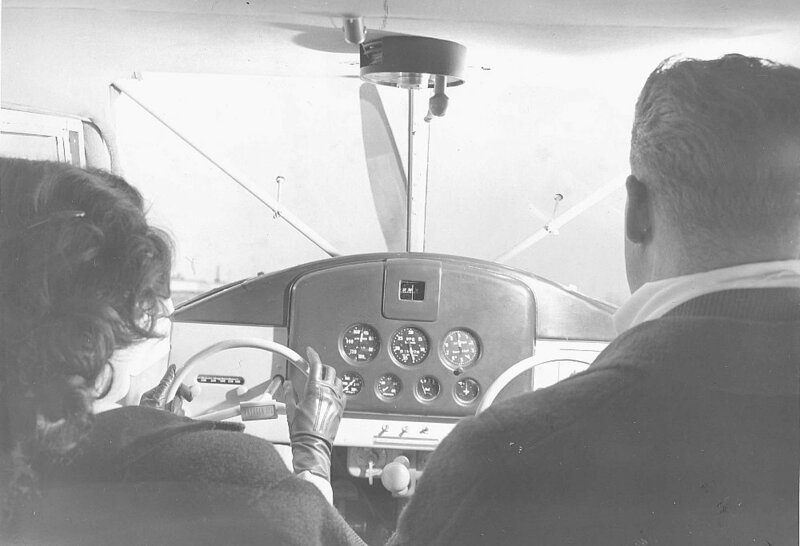 The radio is installed on the right side of the instrument panel, as radios were far less essential than they are today. I wondered if a person wearing a skirt could actually get into a Stinson, this lady proves you can get into a Stinson wearing a skirt. Note the control wheel emblems which say Voyager 125. B&W photo, about 114K. Added 06/27/04. A second Instrument Panel of the Voyager 125 NX31519. By this time the radio is on the left side of the instrument panel, in front of the pilot. B&W photo, about 92K. Added 09/01/11. This is a third view of the Instrument Panel of the Voyager 125 NX31519. This view shows the complete panel. It can be seen the radio receiver is on the left side of the panel, while the transmitter is on the right side of the instrument panel. The transmitter is a RCA model AVT-111 which can transmit on two frequencies, 3105 and 6210 KHz. Receiver is, I believe, an Airadio 6016. Top center is the magnetic compass, left to right middle is the airspeed, tachometer and non sensitive altimer, bottom row left to right are oil temperature, oil pressure, fuel quantity and generator load meter. Lower panel strip has left to right the parking brake, carb heat, then switches for instrument lights, navigation lights and selector for the fuel quantity of the left or right tank. Far right are two push pull controls I can't read what they do. Lower middle left is the fuel tank selector, throttle, and magneto switch with the mixture control below the throttle. The Stinson 125 instrument panel would change considerably as it evoled into the Stinson 150 Voyager. B&W photo, about 126K. Added 04/03/14. Early Stinson model 108 Control Wheel. This control wheel was only used on early 1946 model Stinson 108's. To see the much more common Stinson 108 control wheel take a look at the instrument panel view below. B&W, about 57K. Added 03/01/02. Stinson 108's were delivered from the factory with one of 3 type instrument panels. All 3 panels are interchangeable. Each is painted the same color, dark blue. 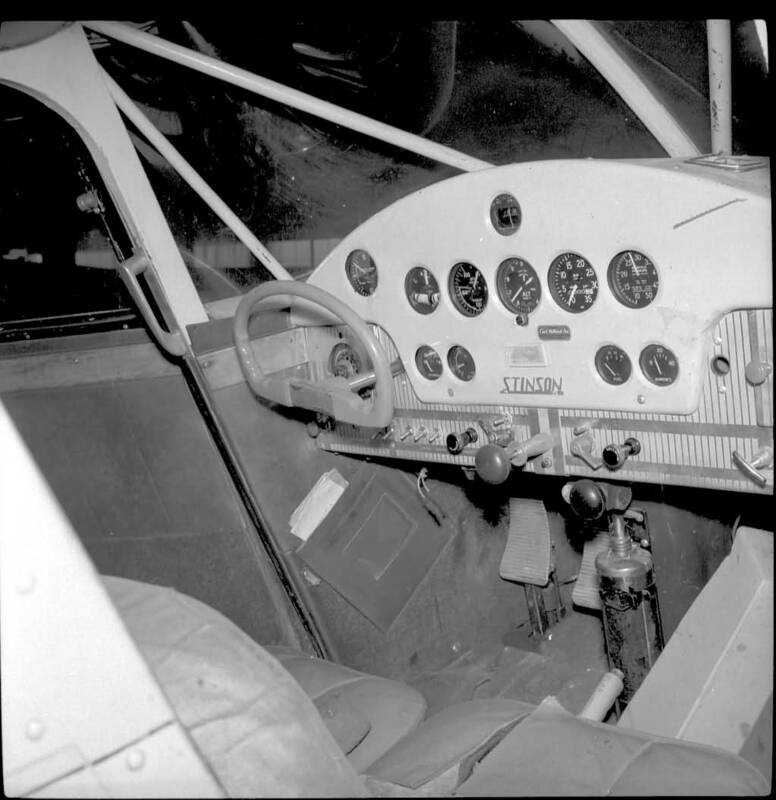 Note the Stinson instrument panel logo is missing from the advanced blind flight panel. The next 3 images are factory photographs showing the different instrument panels available from the factory. Included with each airplane regardless of panel was a two way radio. In the model 108 it was a GE AS-1B, in the model 108-1, 108-2 and 108-3 it was a Hallicrafter CA-2. It is the Hallicrafters CA-2 radio shown in each of these three factory instrument panel photographs. 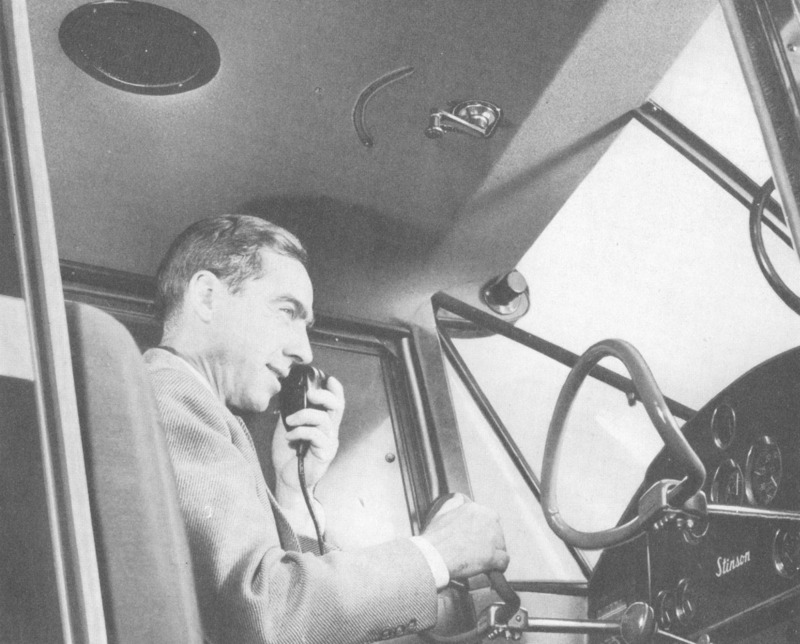 The press release with this information is dated 6/17/47, making these instrument panels as installed on the model 108-2. STANDARD PANEL. The standard panel was the least expensive. It contained 8 instruments; a compass, airspeed indicator, altimeter (NON-Sensitive), time-recording tachometer, oil pressure gauge, oil temperature guage, fuel supply guage, and ammeter. These are instruments required for day contact (Visual Flight Rules today) flight. B&W, about 88K. Added 01/01/05. PRIMARY BLIND FLIGHT PANEL. This panel has all the instruments of the standard panel except the NON-Sensitive altimeter is replaced by a sensitive altimeter, and 3 instruments are added; a clock (wind up), turn and bank, and a rate of climb indicator. The turn and bank is electric, and there is an additional switch added on the right side of the instrument panel when this electric turn and bank is installed. No venturi is needed for this panel. B&W about 99K. Added 01/01/05. ADVANCED BLIND FLIGHT PANEL. 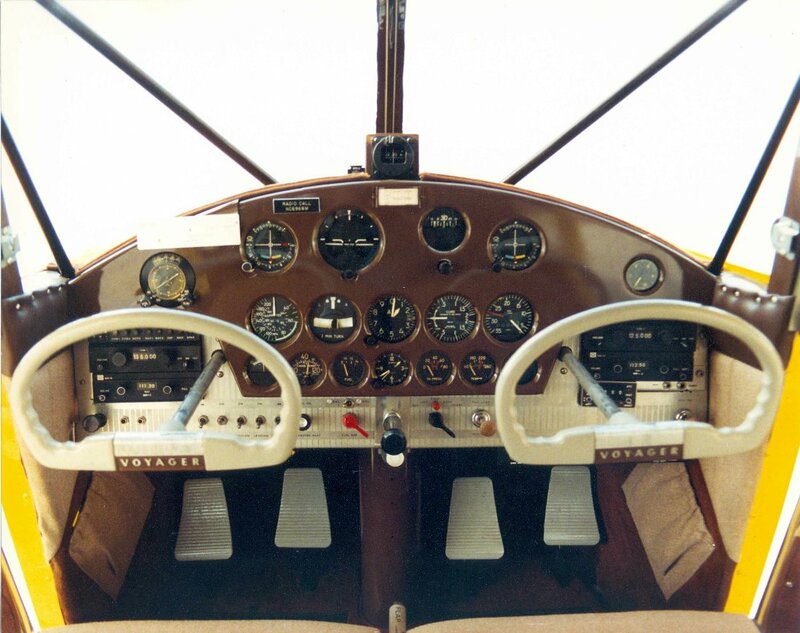 This panel has all the instruments of the primary blind flight panel, and 2 more instruments added; directional gyro and attitude gyro added, and the compass used in the standard and primary flind flight panels is replaced by a direction indicator. The attitude gyro is of a newly developed type which cannot tumble according to the press release with this photograph. B&W about 114K. Added 01/01/05. Photo of a Standard Stinson 108 Instrument Panel. This photograph shows the standard insturment without any blind flying instruments. It appears as if the airplane is not new, but close inspection reveals it still has the Hallicrafters CA-2 radio, making this either a 108-1, 108-2 or 108-3. Registration not available. Photo courtesy of Ron Dupas who tells me the photo was taken by himself at Edmonton, Alberta, Canada in the late 1950's or early 1960's. Ron maintains a very nice homepage with many images, please take a look at 1000AircraftPhotos.com for many other aircraft images. B&W, about 83K, Added 07/25/04. Stinson 108-3 Airspeed Indicator. Stinson 108's are licensed in both the Normal and Utility category. Somewhat unusual is that the never exceed speed (red line) is different for each category. 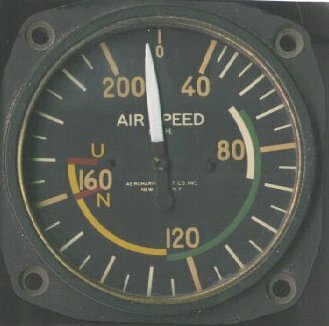 This image shows a model 108-3 airspeed indicator with two red lines. The "N" is for normal category (158 mph max), and the "U" is for utility category (170 mph max). Color about 22K. Added 03/01/02. Full Blind Flying Instrument Panel of Stinson Voyager. View of the instrument panel of 1948 Stinson Voyager 108-3 N6968M. This panel has an artificial horizon and directional gyro plus all other standard insturments to make it a full blind flying panel. The gyros are rebuilt units from WWII, and in fact rebuilt WWII gyros were used in all light aircraft manufactured up until the middle 1960's. Panel is shown with modern transistorized radios. This is serial number 108-4968, completed 5/21/48, and was one of the airplanes included with the sale of Stinson to Piper in December 1948. Instrument panel rebuilt during restoration 1983-1991 using a basic advanced blind flying panel purchased from Univair. Color about 175K. Added 03/16/97.